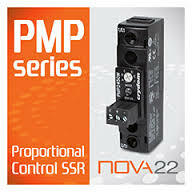 Crydom introduces the PMP Series of Proportional Controllers, a multi-function complement for NOVA22 Solid State Relays. The new PMP Series are panel mounted multi-function proportional control SSRs in a compact 22.5mm housing ideal for applications that require control of the amount of power delivered to a resistive load. These solid state relays can control the load power in proportion to an analog control input, which can be a DC voltage (0-5 or 0-10 volts) or a DC current (4-20 mA); as this control input varies from 0 to 100% so does the output of the SSR. The use of an auxiliary DC power supply allows to have good precision and low noise sensitivity over the full control voltage range. Learn more at www.crydom.com. 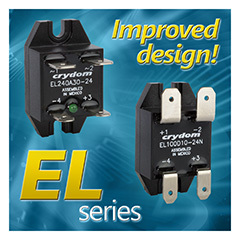 Crydom presents the redesigned range of EL Series AC and DC output solid state relays with ratings up to 30 Amps, making it the highest current rating SSR in this compact footprint. The EL Series SSR comes in a 21mm x 35mm housing with quick connect terminals, ideal for applications where space is at a premium, such as small commercial and medical machines. The internal construction and housing of the EL Series has been re-designed for improved reliability, robust mechanical construction and improved thermal performance. Recently added optional built-in overvoltage protection (internal TVS diode) on AC models, as well as a unique optional 90° bent terminals for applications where vertical space is limited. Learn more at www.crydom.com.